International Non-Olympic University is a member of World Council for Regular and Distance Education (WCRDE), a leading specialized accreditation association for distance education and E-learning. International Non-Olympic University is a certified by ISO 9001-2008 to offer an online program. 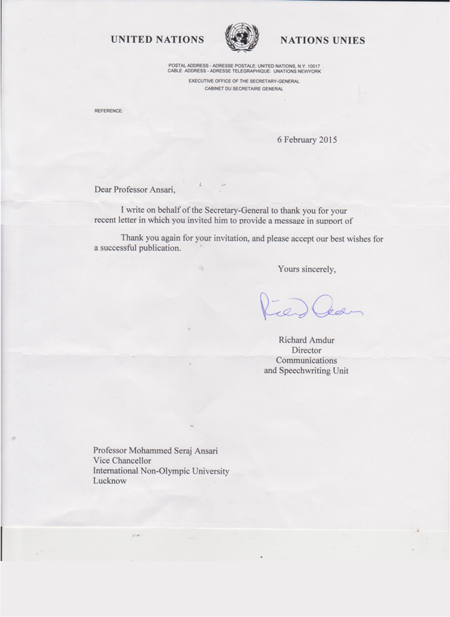 International Non-Olympic University is a University, which offer all courses and is authorised to have a Partnership with International Nobel Peace Prize Recommendation Forum-INPPRF. International Non-Olympic University has received Recognition as Partner of the International Non-Olympic Committee-INOC, which extend to contribute E-Leaning & Campus Systems with Quality Education, One World !! One Education !!! 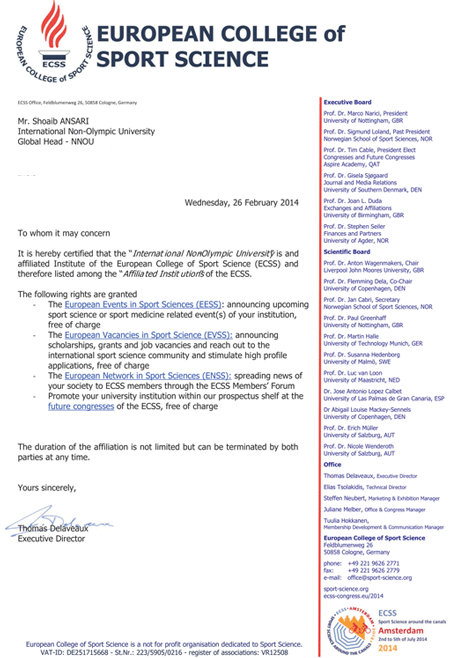 The European College of Sport Science (ECSS), Germany has affiliated International Non-Olympic University - INOU on dated. 13.02.2014. The European College of Sport Science (ECSS) is a sport scientific society dedicated to the collection, generation and dissemination of scientific knowledge at the European level. It supports European institutions, such as the European Union and the Council of Europe, by offering scientific advice and assistance for coordinated European and worldwide research projects defined by these bodies.